Using capital projects, you can define capital assets and capture construction-in-process (CIP) and expense costs for assets you are creating. 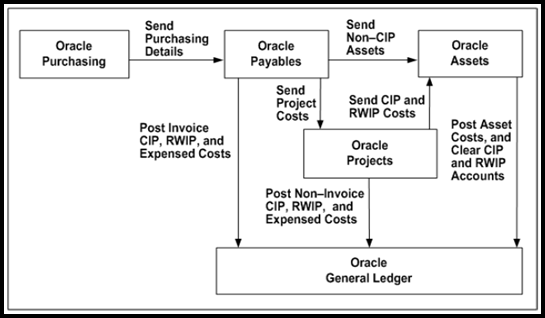 When you are ready to place assets in service, you can generate asset lines from the CIP costs and send the lines to Oracle Assets for posting as fixed assets. Use capital projects to capture the costs of capital assets you are building, installing, or acquiring. We can also use capital projects to create retirement adjustment assets that you associate with a group asset in Oracle Assets. You use a retirement adjustment asset to capture the costs of removing, abandoning, or disposing of assets you want to retire. You define and build capital assets in capital projects using information specified in the project work breakdown structure (WBS). 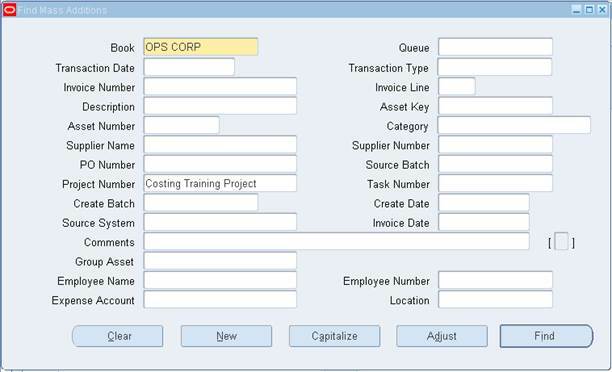 You define asset grouping levels and assign assets to the grouping levels to summarize the CIP costs for capitalization. For capital assets, you must specify whether to capitalize or expense each transaction charged to a capital project. The Capitalizable classification is similar to the billable classification for transactions charged to a contract project. The task and transaction controls you define determine the default value for this classification. Select a default asset book from the list of values. The value that you select for this field will be the default value for all project assets that you create. You can override the default value at the asset level. 1. Enter a name for Project type. 4. Service Type: Select the required service type from the list of values. 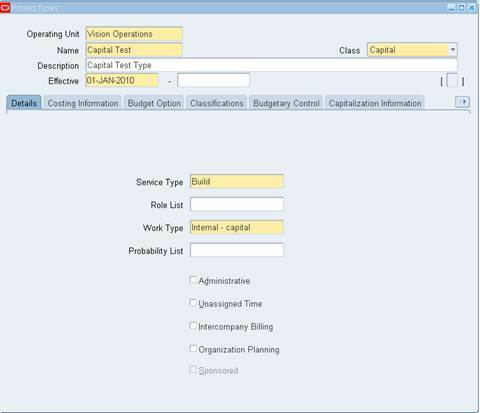 5.Work Type: Select the work type created above in the setup. 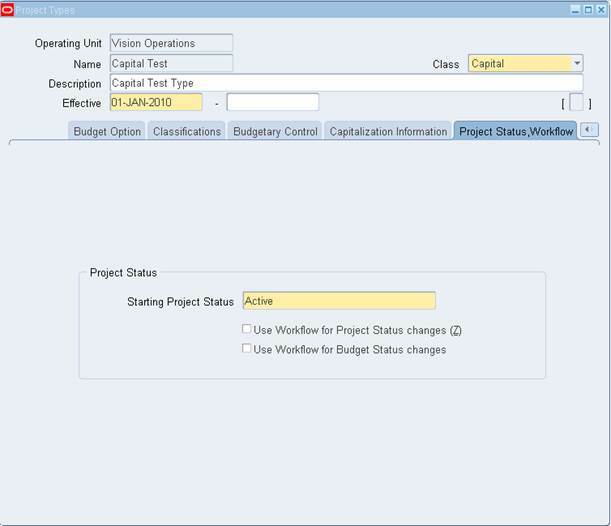 Click on the Capitalization Information Tab (Tab gets enabled only when the project class is ‘Capital’). 6.Cost Type: For the project type, specifies whether to capitalize costs at their burdened or raw cost amount. 7.Require Complete Asset Definition: Specifies whether an asset definition in Oracle Projects must be complete before you can interface costs to Oracle Assets. If you select this option, you do not need to enter information for the imported asset line in the Prepare Mass Additions window in Oracle Assets. 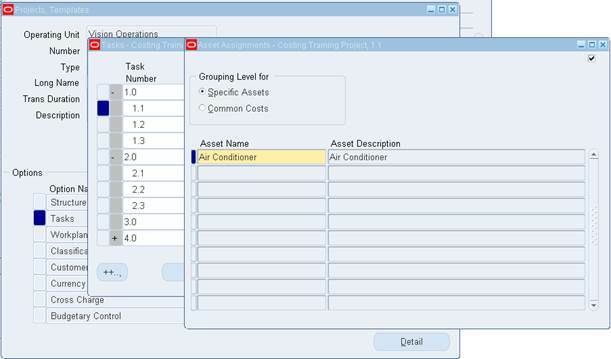 The Asset Interface process places asset lines with complete definitions directly into the Post queue in Oracle Assets. 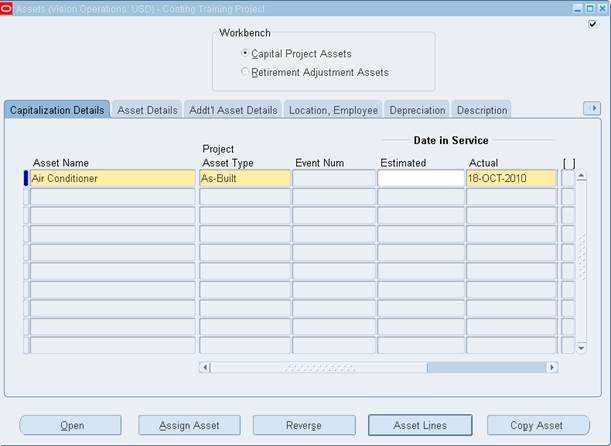 8.Override Asset Assignment: This field interacts with the assignment status of the asset to either call or disregard the Asset Assignment client extension. 9.Asset Cost Allocation Method: You can select one of several predefined allocation methods to automatically distribute indirect and common costs across multiple Assets. 10.Event Processing Method: You can specify a capital event processing method to control how assets and costs are grouped over time. 11.Grouping Method: Specify how to summarize asset lines. 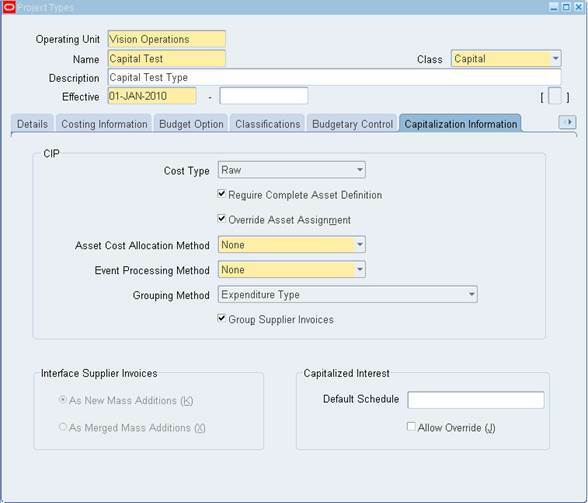 12.Group Supplier Invoices: Select to consolidate the expenditure items on a supplier Invoice into one asset line according to the method specified in the Grouping Method field. 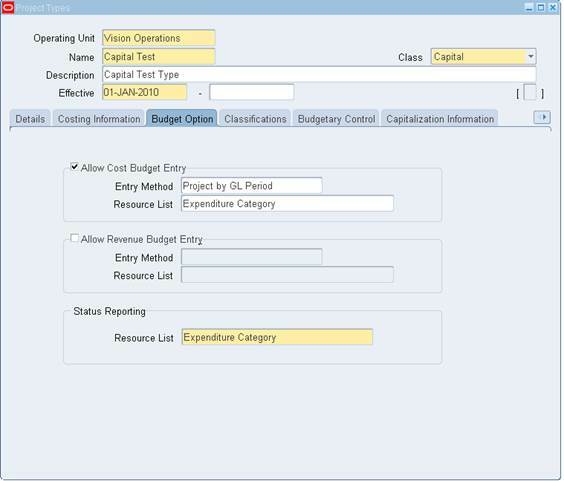 Enter Asset name, Asset Category and the estimated cost. You can change the grouping level type at any time. 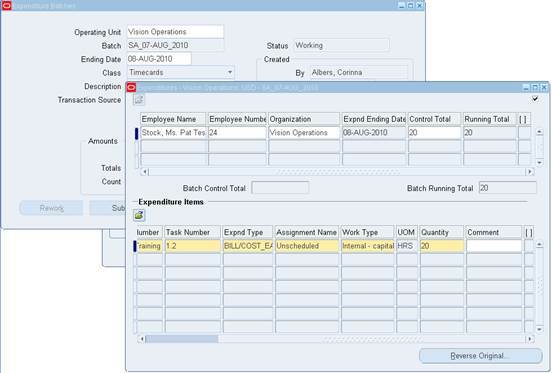 If you change a grouping level type from Specific Assets to Common Costs, Oracle Projects deletes existing asset assignments from the grouping level. 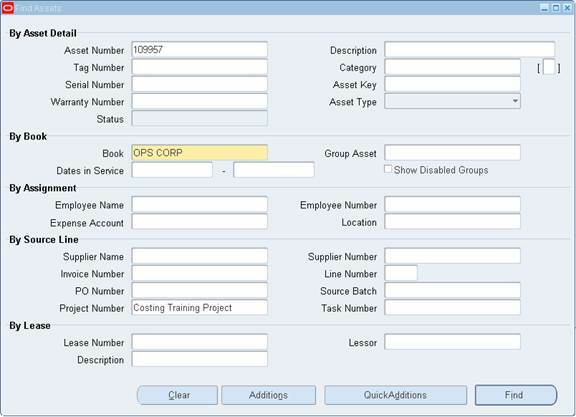 Changing the grouping level after you have interfaced assets does not affect the asset lines previously sent to Oracle Assets. 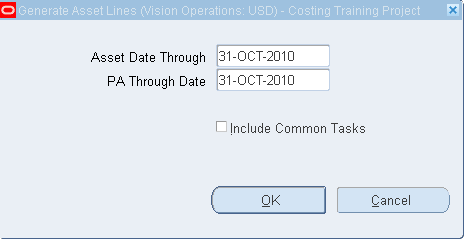 Specific Assets: Select this option to associate assets with the project or task. The Generate Asset Lines process generates asset lines from the specific assets and costs you associate with this grouping level. 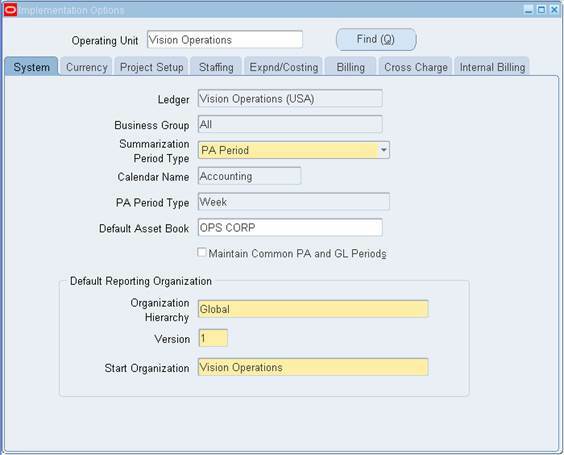 Common Costs: Select this option to group projects or tasks that capture costs you want to allocate to multiple assets. When a CIP asset is complete, you place it in service. If your project has more than one CIP asset, you can place each asset in service as it is completed. You do not have to complete the entire project to place an asset in service. You place an asset in service by entering the Actual In-Service Date for the asset. You will need to run PRC: Update Project Summary Amounts in order to generate Asset Lines. Now, click on Assets Tab in order to change the Project Asset Type. Select As-Built from List of Values and update the Actual Date as System Default Date and Save your work. Note: You cannot send assets to Oracle Assets whose actual date placed in service is later than the current Oracle Assets period date. The Generate Asset Lines process creates summarized asset lines for capital assets . Oracle Projects creates asset lines based on the asset grouping level you choose within a project and the CIP grouping method you designate for the corresponding project type. 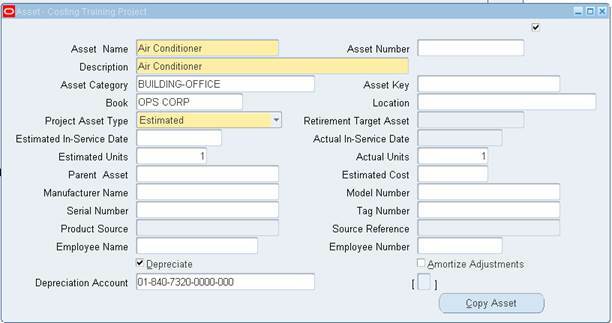 The grouping level represents the WBS level at which you assign assets or group common costs. 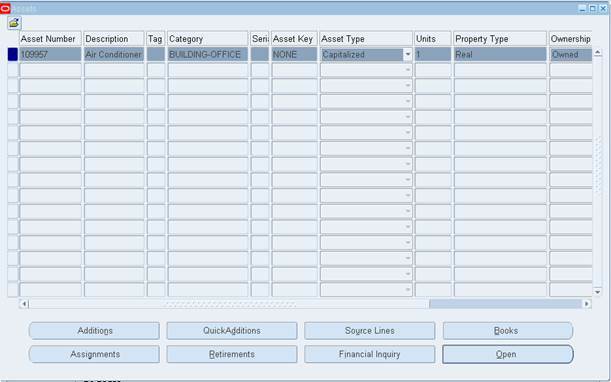 Click on Generate Tab to generate Asset Lines and interface the Assets to Fixed Assets. Always update the PA through Date as the Month Ending Date. 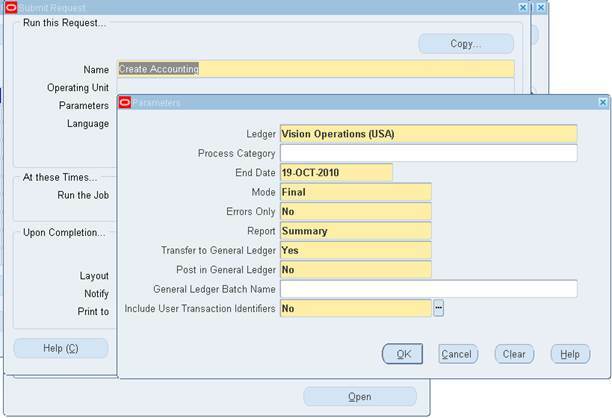 Prior to Interfacing the Asset Lines to Oracle Assets, you will need to run the Create Accounting Program to transfer the Payables Invoice to General Ledger in Payables Responsibility. Note: Here the source of the Asset Lines is a Payables Invoice. Ledger will be your Set of Books and End Date will be the current system date, thereby ensuring that all the Payables Invoices will get transferred to GL. 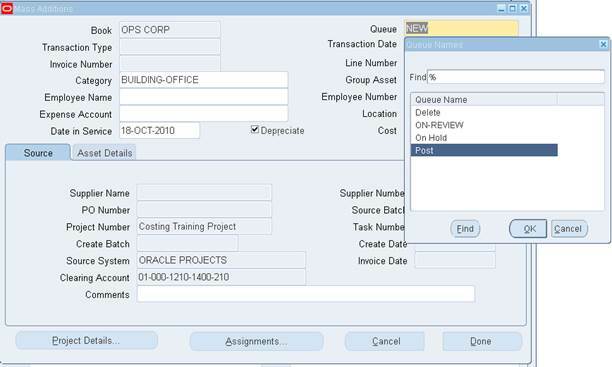 You run the Interface Assets process to send asset lines from Oracle Projects to Oracle Assets. This process merges the asset lines into one mass addition line for each asset. 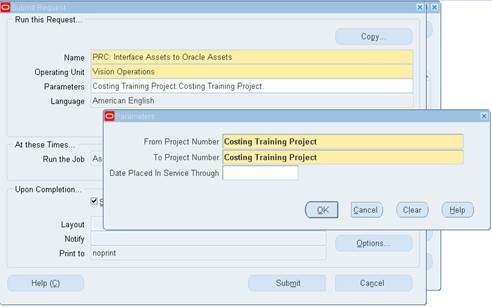 The mass addition line appears in the Prepare Mass Additions Summary window in Oracle Assets as a merged parent with a cost amount of zero and a status of MERGED. 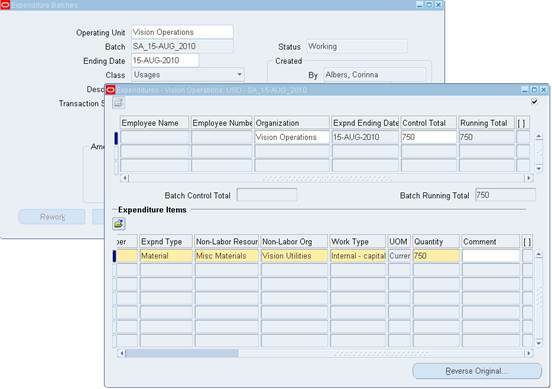 The line description is identical to the description of the expenditure item in Oracle Projects. Input the Book ID and Project Number and Click Find. You will find two lines Merged and New. Change the Queue from New to Post, update the Location and save your record. 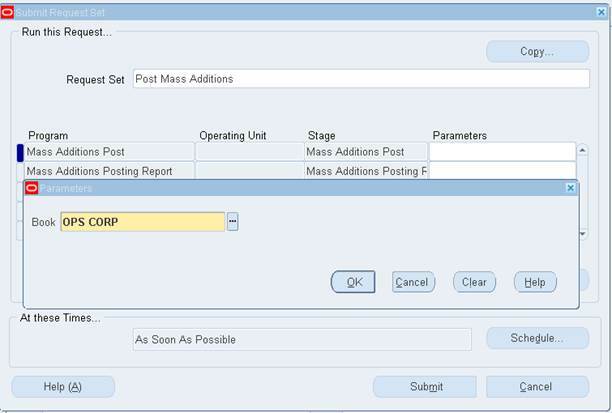 Now, run the Post Mass Addition Report, input the Book Name and click OK and Submit the Report. Now, check for the Asset Status if it has changed to Capitalized. The Asset Type has been changed to Capitalized. This ends the Capitalization Process. Hello, nice document,was very helpful but i discovered that after interfacing an amount from projects to asset successfully( both item and vat), only the tax line appeared (the transaction originated from AP supplier invoice which was interfaced to oracle projects and the fixed asset). what could be the cause?